Are all containers really created equal? All containers pretty much look the same and to a certain extent are the same. The fact is they all meet the same ISO standards making them interchangeable in intermodal transport. But what does ISO cover ? In the case of containers they cover classification, dimensions and ratings. Basically anything related to size, load capacity calculations and fittings; which need to be interchangeable throughout fleets. We all know there are hundreds of ways to make beer – or cakes – using similar ingredients that will achieve similar results, but with some variations in the end product. In short, there are 1000 ways to skin a cat and container manufacturing is no different. This paper will help explain how units may differ in quality and consequently in price. Some differences are obvious while others are much more subtle. At the end of this article you should have a better understanding of what to look for when buying a new container. Do you know how containers are made? See a shipping container built in 120 seconds! Let’s remember that these numbers will vary based on raw material prices which fluctuate with worldwide demand. 15 to 20 years ago both mild steel and Corten steel (Corten is a trademark of US Steel) were used in container manufacturing. Over the years, Corten (a carbon enriched steel with higher corrosion resistance) and its equivalents have become the prevalent type of steel in container manufacturing. The underlying principal with steel is fairly simple; the more steel used, the higher the cost. But why would you have more or less steel ? This essentially depends on the thickness (amount) of material used. How thick are the cross members ? 4.0 mm ? 4.5 mm ? How many cross members does the container have? (YES, you can remove a cross member and retain a 30T rating!) How thick are your door or side panels ? 1.6 mm ? 2.0 mm ? Or is it a mix and match? These are all variables that go into constructing a container. In the end, the thicker the steel, the more resistant it is, the more weight is added, the higher the cost. Ever wondered why units with a 30T MGW have different tare weights? Some of the early containers were fitted with full boards of Oak. Today, most shipping containers are fitted with floors made out of tropical HARDWOOD plywood. As with Oak, because of the time it takes to grow the hardwood trees needed, there have been experiments with synthetic floors (that didn’t work well) and bamboo plywood. Bamboo which grows extremely fast seems to be the most obvious solution for the future and is not much more expensive than regular hardwood. Just like going to Home Depot there is plywood you wouldn’t buy and therefore plywood you wouldn’t want in your container. Plywood quality should be checked on-site prior to fitting. The paint system is actually one of the most critical parts of a container. It can make a big difference in the way containers age and rust. If application was an issue in the past, the modernization of factories means that while there are still differences in paint application quality, the extremes are nowhere near where they used to be. Most containers built today get a decent paint job. The desired DFT (Dry Film Thickness) is set out in the container specifications and should be measured by quality control inspectors after production. The thicker and uniform the coating, the more protection. Zinc is the single most expensive component of the primer and the whole paint system. It creates a cathodic protection (basically a chemical reaction) which protects the steel from corrosion. The more ZINC, the ticker the primer, the more protection against corrosion. Bituminous can be applied partially or to the whole container understructure. (Yes, we have seen people trying to save on bituminous undercoating by only partially spraying the understructure). 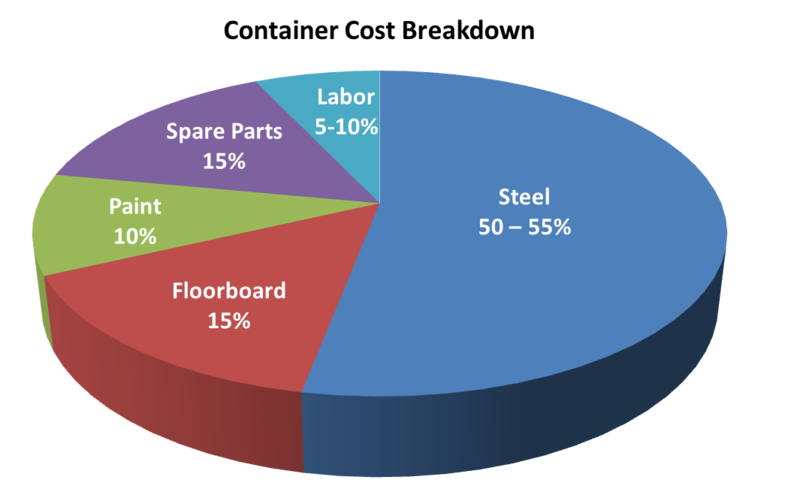 So, steel, flooring and paint are the three basic things to look into when comparing products before making a decision. Take a few minutes to ask questions because you would be surprised how easy it is to save 5% to 7% on material costs; savings that nobody would notice by just looking at the unit. It should be noted that manufacturers do not decide what goes into the specification, but the person ordering the containers does. It is obviously easier to tweak specifications when ordering 100 units than if ordering 10. However, there are certain standards that shouldn’t be compromised (unless you knowingly do so), and should be met by your supplier. Quality is the foundation of your investment which will ensure longer asset life and generate return without having to pour more money into it. Factories have quality control departments that have significantly approved in the last 15 years. However, every production should be inspected by an independent and reliable surveyor. The surveyor will be able to check the quality of the materials, ensure the specification chosen is met and look out for quality workmanship at the time of production. An independent surveyor will issue an “Acceptance Certificate” once the containers have been inspected offline. Any container supplier should be able to provide a copy of the “Acceptance Certificate”. Quality is best controlled in a consistent repetitive production. This normally translates to whole batches and series being produced at once, usually with all the same specifications and color. If you’re ever offered new units with a variety of different colors and inconsistent serial numbers, you may want to inquire about the history of those units. It’s possible they were rejected at the factory. This does not necessarily mean they are bad, but worth looking into a bit more. We do not believe in so called “low spec units”, even if the containers are meant for domestic and will always encourage our customers to prefer quality over price. The savings that can be made will equate to no more than 1 or 2 months of lease in the domestic market, but in the long term, they could cost years in asset life. Please let us know if you have any thoughts or questions at info@csiu.co.